The Vancouver weather has been, let's put it crappy, and when I found a break in the dreariness off I went for a nice spin. Rain and grey in Summer? 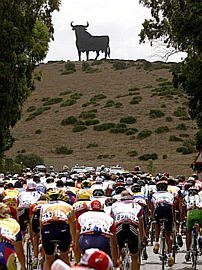 I couldn't help but think of this Saturday's start of the 63rd Vuelta a España. All eyes will be looking to sunny Granada with the team time trial. The mighty Astana machine comes rolling in with Alberto Contador as main favorite for the overall. Can a hat-trick be forthcoming? The young twenty-five year old Contador has already two Tours under his hat; 2007 Tour de France & the 2008 Giro d'Italia. With Denis Menchov deciding not to defend his title, Contador has hungry sharks like 2008 Tour victor, Carlos Sastre eager to provide a good fight. The other could come from within his team: Levi Leipheimer could take it away 'if' Contador falters. But, the unified Astana team will ride for the young Spaniard. They have placed the Vuelta as target number one to win it. And the Spaniard winning on his home soil is good enough reason. Lots of if's and but's as swirling Spanish winds start to blow. Other sharks I like are Yaroslav Popovych(Silence-Lotto) and Damiano Cunego(Lampre). They both dearly want to improve from their luckless Tour de France and maybe just maybe put a dent on the overall. Both guys are capable. Now, with the writing on the wall, could it be that Contador is too good not to finish first and the rest will fight for second place? Time will tell as Spanish fans' eyes are smiling! Indurain lost to Melchor Mauri for second overall. Mauri proved to be the stronger by winning three stages. Big Mig didn't win any! What I meant was that the final time trial is the very last place I'd expect Indurain to lose a grand tour.